Spending time at a quiet beach can be a very relaxing experience. After all, there’s so much open space to wander around freely and of course you can lie down for a calming session of sunbathing. But then, you also don’t want to end up with tanned and burnt skin due to over exposure to harsh sunlight. So, the next time you are heading to the beach with your friends or family, make sure you carry a beach tent with you which will provide shelter and shade while you have lots of fun. Most of the beach tents are lightweight and portable and you can effortlessly set them up. 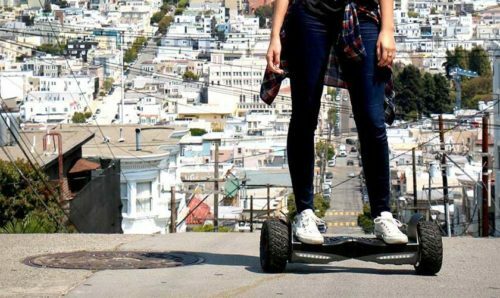 They come in different sizes and price points and some may have a few additional exciting features. We have listed below the ten best beach tents in the market. Read ahead and find out the perfect beach tent that fits your needs. The Outdoor Master pop up beach tent indeed a master when it comes to providing comfort and convenience at the beach. This pop up tent goes up in seconds sans any hassle and can be taken down just as easily. And with the stakes, in-built sandbags, fiberglass poles and strings, it will be steady and you can secure it firmly on any terrain. It weighs at just over 8 pounds. Made from durable polyester and oxford fabric, this beach shelter comes with a UV SPF 50+ Protection from sunlight and the material is waterproof with a rating of PU3000 making this beach tent a perfect shelter from rain, wind and the sun. This pop up tent has a zipped door which can be closed if you need more privacy and can double up as a changing room. It has see-through windows which let in the breeze but you can close it with shades for more privacy and protection from the sun. There are also pockets for keeping your essential items. You also get a tent carry bag along with this beach tent. See more information on Outdoor Master Pop Up Beach Tent. Easy setting up and folding down mechanism. PU3000 waterproof material with UV SPF 50+ protection. Built-in sandbags and fiberglass pole for more stability. Stakes and strings to secure firmly on any terrain. Zipped Doors and Windows with shades for more convenience and Privacy. The Outdoor Master Beach Pop Up Tent is on top of our list of the best beach tents and the best overall. The waterproof material and protection from the sun make it an all-weather pop-up tent. With simple set up and take down, and easy portability you can carry this anywhere you want and will be a perfect beach shelter for you. Compact, convenient and coming with some amazing safety and convenience features, the Wolfwise Easy Pop Up Tent will immediately catch your attention. This beach tent requires no assembly and pops up and folds down with ease. Its spacious interiors can comfortably accommodate 3- 4 persons and with its big front entrance and rear door, and a whole bottom mesh design, you will get really good ventilation. What makes this beach tent stand apart is its build and high-quality material. It is made of anti-tear 190T polyester for long durability. It has frames made of galvanized steel which are stronger, durable, corrosion resistant and provide extra stability. You can also fill sand in the in-built sandbags for more support. 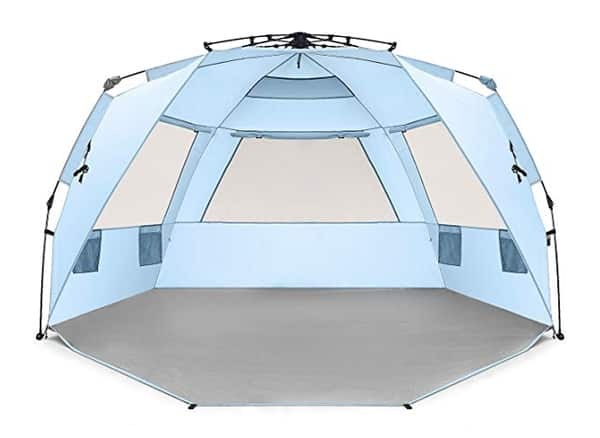 The tent comes provide UPF 50+ protection from harmful sunrays and the water repellent tent surface with taped seems keeps the moisture out and the interiors totally dry. The mesh windows allow the breeze to come in but you can close it anytime you want. With two storage pockets below each window, you can store small things. This beach tent weighs at just 4.6 lbs and along with it, you also get a tent carry bag, 4 wind ropes and 8 stakes as well. 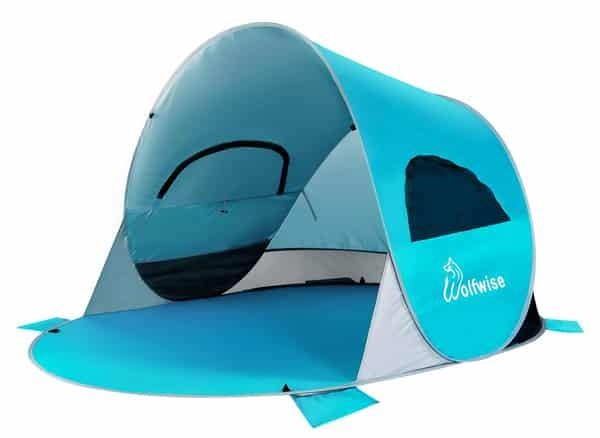 See more information on Wolfwise Easy Pop Up Tent. Spacious interiors. Whole bottom mesh design, Large entrance and rear door. Anti- tear 190T polyester waterproof material with UPF 50+ sun protection. Galvanised steel frame for greater stability. Easily pops up and folds down. The Wolfwise Pop Up Tent is the second on our list of the best beach tents and the best premium. It boasts of some outstanding specs to justify its premium price. With spacious ventilated interiors, durable waterproof material, steel frames and UV protection, this beach shelter leaves nothing to ensure your total comfort while you are at the beach. If you are willing to spend some more, then you should definitely go for this beach tent. The iCorer Cabana Beach Tent may be all that you need for a comfortable shelter while at the beach. This compact and lightweight beach tent has an awesome cross top design and opens up or folds down in seconds. The nylon fabric material, it is made of is flame resistant and comes with a silver coating on its surface for UPF 50 protection from UV rays. For greater stability there are built-in sandbags on the sides. You also get 6 metal stakes that are provided to secure it tightly on the ground. A large mesh window on the rear side provides good ventilation and light to come in. 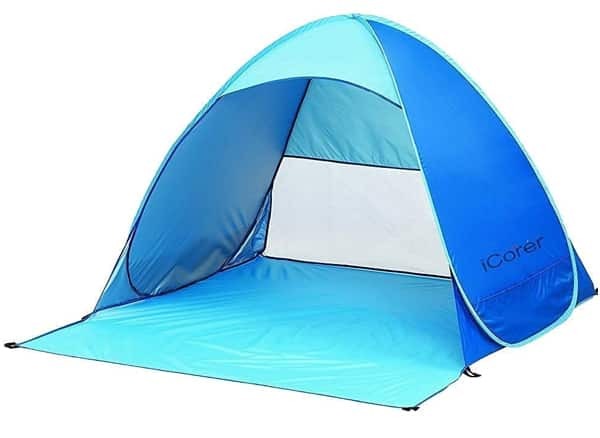 With a weight of just 2.2 pounds, this pop up tent is very lightweight and portable and easily fits into a carry case which you get along with this beach tent. See more information on iCorer Cabana Beach Tent. Flame resistant nylon fabric material with UPF 50+ protection. Large mesh window for good ventilation. 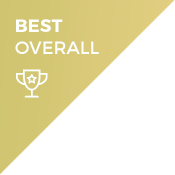 The iCorer Cabana Beach Tent is the third one on our list of the best beach tents and the best value. 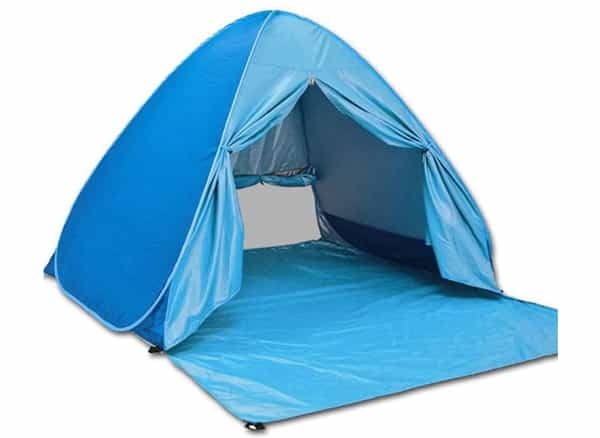 This affordable beach shade provides all the comfort and convenience you would expect from a pop up tent. Moreover, this multipurpose tent can be set up for a relaxing time either at the beach, in the woods or in your own backyard. If you are on a tight budget, you would definitely like opting for this beach tent. The Easthills Outdoors Beach Tent is a large sized beach shelter that can easily accommodate 4 adults and children or pets. Easy to set up and take down just like other pop up tents, this enormous tent easily fits into a carry bag. Weighing at 8 pounds it can be carried easily on your shoulders in the carry bag. 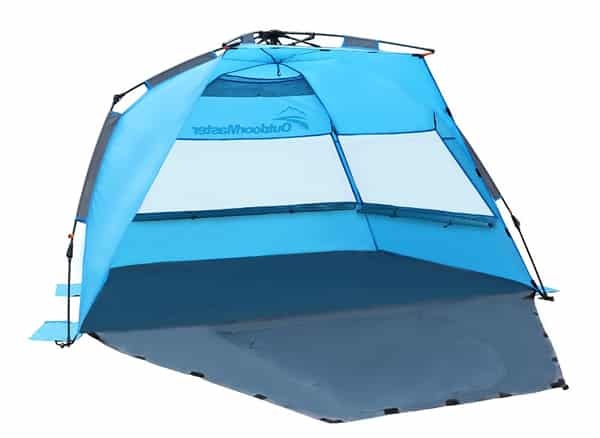 This beach tent is made of 185T water resistant polyester with UPF 50+ sun protection. And has a 53-inch front porch. The interiors of this beach shade are well ventilated and has screen windows with flaps on three sides. This provides clear 360-degree view. The entrance of the tent can be close with the zippered front porch offering more privacy and convenience when you want to change clothes or breast feed your baby. This tent comes along with 10 plastic stakes and 4 guylines to provide more stability in windy conditions. And the built-in sandbags with Velcro allows you to empty the sandbags quickly while folding down the tent. See more information on Easthills Outdoors Beach Tent. Large tent that easily accommodates 4 adults and children. Portable and fits into a carry bag. Mesh windows on three sides for good ventilation and 360-degree view. Front porch that doubles up as zippered front door. Plastic stakes and Guylines for extra stability. For a comfortable family outing at the beach, the spacious Easthills Outdoors Beach Tent would be an ideal choice. With its UV protection and high-quality material, it would make for a perfect beach shelter. It combines privacy, safety and convenience all in one and serves you a product that will deliver on its promise. A worthy option to go for. With the telescoping pole of the umbrella, it is easy to fix the canopy on the ground you can adjust its height as well. There are two zippered side windows and top vents for adjusting ventilation and light inside the shelter. For stability, the pole has pointed metal tip attached with a screw to stick firmly on the ground and comes with 8 steel stakes and 3 tie-down cords. It comes in different color options can be easily carried in a bag. See more information on Sport-Brella X-Large Umbrella. Use it as dome or a beach canopy. Made of 210D waterproof material with UV protection. Adjustable height up to 9 feet. Metal tip, stakes and strings for extra stability. Windows and air vents for visibility and ventilation. 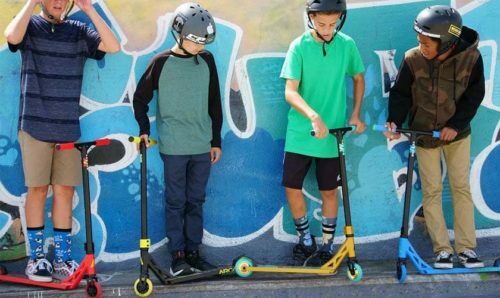 The Sport-Brella is definitely a good product to go for if you want to try out something different than the usual. 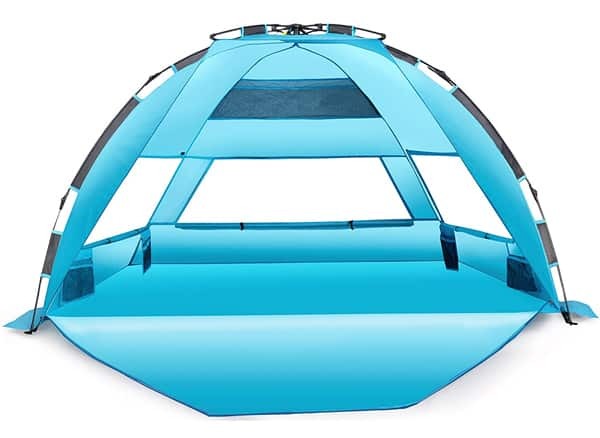 This dual role beach tent with its superior material, sturdy build and stability features will ensure you have an amazing time at the beach. Being lightweight and portable, you can handle this without a hassle. 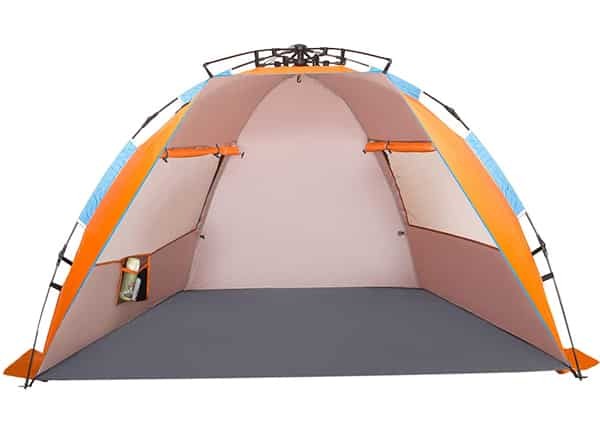 Here’s another popular spacious beach tent that can fit in 3-4 people for a comfortable trip outdoors. The Pacific Breeze Easy Setup Beach Tent, is easy to install and fold and looks similar in design to the Easthills Outdoors but is a tad smaller. Portable and lightweight, it weighs at 6 pounds and easily folds into a bag. The water repellent material comes with UPF 50+ sun protection and water-resistant tent floor for a dry and comfortable outing. The fiberglass frame and 4 stakes and 5 inbuilt sandbags provide you a beach shelter that is sturdy and stable in windy conditions. The windows on three sides along with the roomy interiors provide enough ventilation and light. For additional comfort, the pop up tent has internal pockets and hooks to store and hang personal items. Plus, you get a small bag to carry the tent on your shoulders. See more information on Pacific Breeze Easy Setup Beach Tent. Spacious and well-ventilated interiors to house 3 to 4 persons. 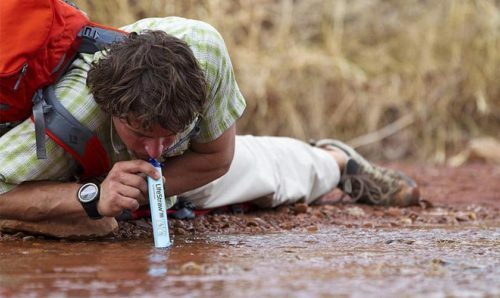 Water repellent material with Sun Protection and water-resistant floor. Lightweight and fits into a bag. Fiberglass frame, In-built sandbags and stakes. The Pacific Breeze Easy Set Up Beach Tent would be good buy for its large interiors and the popular hub system design. This beach tent is good option to go for if you are heading out with your family, it is an ideal multipurpose tent, for any outdoor activity whether you are going to the beach, on the hills or by the river side. You can definitely include this in your shopping list. 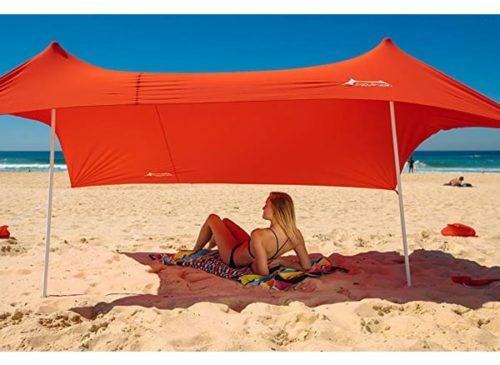 The Augmyer Beach Tent is a supercheap beach shade with all the essential features you will need. This compact beach tent with a cross top design easily goes up in seconds. Made of elasticity metal material, it can be folded or bent tons of times without any damage. The material is made of anti-tear 190T waterproof material and the silver coated fabric provides UPF 50+ sun protection for a comfortable outing. The double type dense window mesh at the rear gives enough ventilation and prevents bugs from entering the tent. This beach shade has a front extension porch of 25” allowing you to lie down or keep your essential things. To more stability against strong gusts of wind there are two sand pockets, 4 fixed bands and 6 strong stakes to fasten the tent firmly on the ground. Weighing at just over two pounds, it is lightweight and you get a carry bag as well to carry this tent. See more information on AUGYMER Beach Tent. Cross Top design and easy set up. Elasticity metal material, flexible and foldable. Front extension porch of 25”. 2 sand pockets, 4 fixed bands and 6 strong stakes. 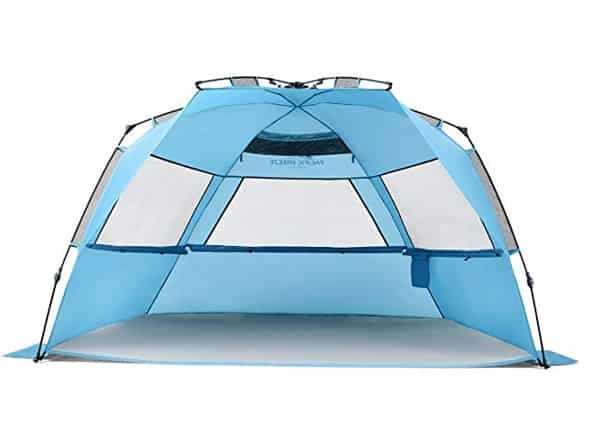 The Augmyer Beach Tent is a super low on price but packs in all that you will need for a comfortable time at the beach or anywhere outdoors. 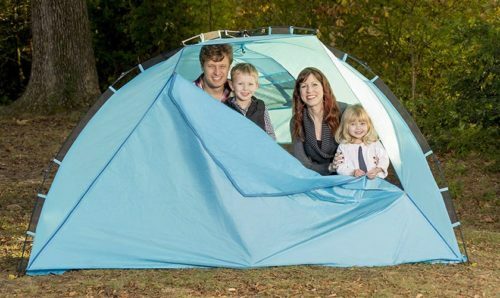 Made of flexible waterproof material, this pop up ten is easy to set up and will be an ideal sun shelter with its UV protection. It is lightweight and portable as well. if you are low on budget, you can certainly go for this beach tent. The ZiggyShade Beach Sunshade is the perfect open beach tent you would need for enjoying the view and the sea breeze while at the beach. This beach canopy is made of strong and flexible Lycra fabric and comes with UPF 50+ protection from the sun and is sand repellent as well. This beach tent can be installed easily in a couple of minutes by a single person. You erect the tent with support of two poles and the sandbag anchors provide your beach shade with stability in windy conditions. The direction of the beach tent can be adjusted easily by moving the sandbags and poles. You also get 4 stakes in case you ever plan to set up your shelter on firm terrain like a park or on the sides of a playground. Weighing at just over 4 pounds, it is easy to carry and easily fits in a bag which you can carry on your shoulders. This beach canopy comes in numerous attractive colours like red, green, blue and so on for a colorful time at the beach. See more information on ZiggyShade Beach Sunshade. Strong and elastic Lycra fabric. Sand repellent material with UPF 50+ protection. 4 sandbag anchors, 2 poles and 4 pegs easy set up and stability. For taking care of stability this beach tent has frame made from 8.5mm fiberglass and comes with 8 sand pockets, 8 steel stakes and 4 guylines to secure it firmly to the ground. For added convenience is a storage pocket on the inside to keep small items. This beach tent has an awning built into its design to provide extra shade while outdoors. It weighs at just 4 pounds and fits into a bag. See more information on Oileus X-Large Beach Tent. 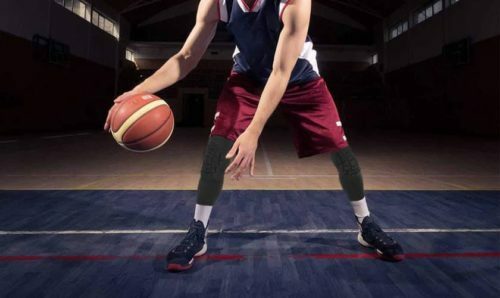 Anti-tear 210T polyester, 3000PU waterproof rating with 99% protection from UV rays. Durable tent floor made of 150D material. Fiberglass frame, steel stakes, guylines and sand pockets for stability. The Oileus beach tent boasts of some high-quality material used in its make. Its durable tent floor, superior anti-tear and waterproof material together with UV protection make it a really good option if you are looking for fine beach tent. Easy to install and fold, this tent comes with an extra shade at the top. This pop up tent is certainly among the best beach tents at this price. The last one on our list of the best beach tents is the Arcshell Pop Up Beach Tent. This tent has although coming at a low price will surprise it some premium quality features owing to its superior material when compared with others in its category. This easy pop up tent is made of 190T anti-tear polyester material and the floor has 210D durable tent floor material for long term use. The 3000PU coating makes it water proof and with its UPF 50+ protection it will shield you from the harmful rays of the sun. Spacious enough to accommodate 2 beach chairs, you will have a comfortable time inside this beach shelter. It has 8.5mm fiberglass pole frame for greater stability and comes with 6 stakes and 5 sandbags to secure it firmly on the ground. This beach tent has an extended dome for providing extra shade and protection from the sun and three closable windows to provide better view and ventilation. The 4 pockets means you can stash away any small items you have. The front porch doubles up as a zipped front door for privacy and more convenience and the zipper is electroplated zipper so it wont rust when it gets wet. Weighs close to 6.5 lbs and easily folds into a bag. See more information on Arcshell Pop Up Beach Tent. 190T anti-tear polyester, 210D durable tent floor. UPF 50+ sun protection and 3000PU waterproof. 8.5 mm fiberglass frame with 6 stakes and 5 sandbags. Front door with zipper that acts as a front porch when opened. 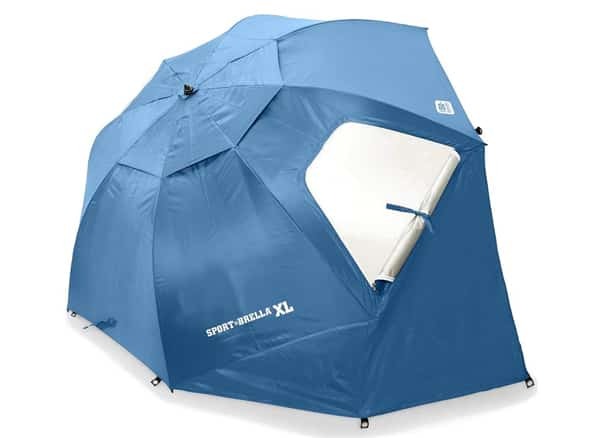 The Arcshell Pop up beach tent is a good option if you are looking to get some premium features but don’t want to spend too much. Boasting of superior quality material, this beach tent will ensure you have a good time at the beach. And with its easy portability you can take it with you on any trip outdoors whether it be the beach or camping in the woods and so on. While beach tents are good shelters to take with you while heading to the beach, you can also take it along for a trip outdoors in the forest, on the riverside or just about anywhere. However, it is important to understand certain things before you finally buy a beach tent. Quality and Type of Material: The quality and type of material used is important to be looked at. 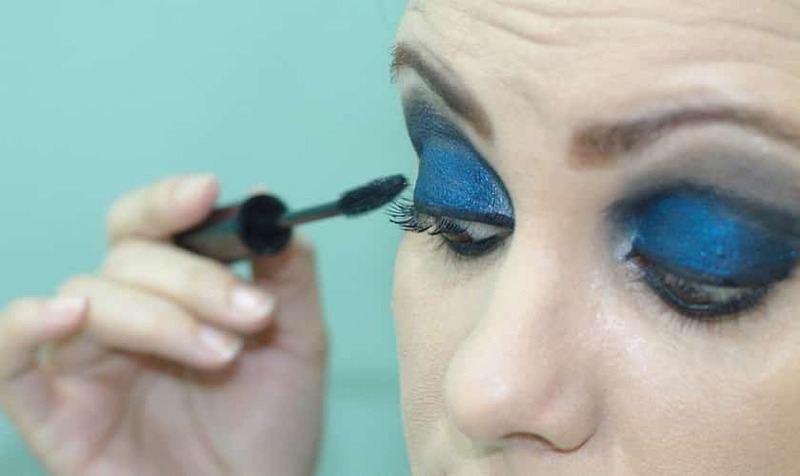 Whether it is nylon or polyester, whether it is water proof or not, the level of protection it offers from the harmful UV rays, anti-tear threading density are some things to pay attention to. Similarly, steel frames are stronger than fiberglass or aluminium frames and provide more stability. Size: It is another important factor. Whether your tent can accommodate the number of persons you wish to. Or will you require two separate tents. Smaller tents are lightweight and hence easier to carry. Stability: Of course, you would not want your tent to be blown away by stronger winds. Which is why you should look at how stable is your tent going to be. How many stakes, built of which material you are getting, does the tent have sand pockets and will you get guidelines are some of the things to look for. Ease of Use: Whether the tent can be set up and taken down easily, whether it is portable and will it be long lasting are some other factors which you may wish to consider. Privacy: Your pop up tent will be you own little private space. So you can change your clothes, take a nap or just relax without being bothered by anyone. Safe Storage Place: Many of the good beach tents have zipped doors which can be closed from inside and outside. You can use the tent to preserve your valuables. Beach Cabana: This type of tent can easily fit the whole family usually 4 persons and provide great comfort and privacy with a zipped closable front door. Pop Up Tent: It is usally a smaller and more compact tent suitable for 2 persons. It can be set up very easily and are extremely light weight and made of elastic metal material for more flexibility. Beach Canopies: These are open tents with just a roof on top allowing for clear view and be closer to nature. They can accommodate more people. But they are also easy to set up. Umbrella Type Canopies: Certain beach tents double up as umbrella shaped canopied with an adjustable poll to modify the height. They are sturdier and heavier but are good option for a safe and comfortable time at the beach.